Paul Wyeth RP was born in 1920 and lived in London. 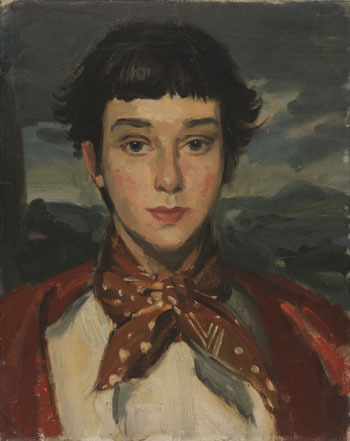 He studied at Hammersmith and Willesden Schools of Art and the Royal College of Art intermittently between 1934 and 1948, under teachers including Douglas I Smart, Raymond Coxon, Gilbert Spencer and Alfred Egerton Cooper, who painted a portrait of Wyeth in battledress. He went on to teach at Hammersmith School of Art and the Sir John Cass School. 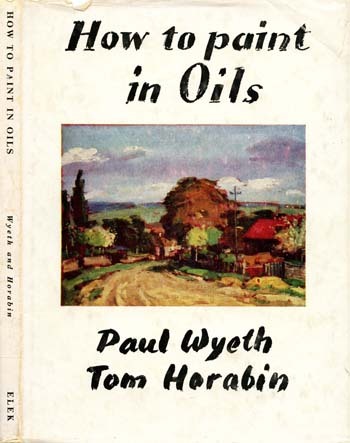 He wrote instructional books including How To Paint in Oils (with Tom Horabin; Paul Elek, 1953) and How To Paint In Water-Colour (International Publications Service, 1958), and in 1964 contributed a series of technical articles to The Artist magazine. Wyeth painted several murals at York Assembly Rooms during their 1951 restoration. His most prestigious commission was a portrait of Sir Winston Churchill, in commemoration of the former Prime Minister's investiture as a Knight of the Garter in 1953. He was a member of the Royal Society of Portrait Painters, the Royal Society of British Artists and the Soci&eacute;t&eacute; des Artistes Français, and won Gold and Silver medals at Paris Salon. He also showed at the Royal Academy, Wildenstein, Mall Galleries and Grundy Art Gallery, Blackpool. The actress Carina Wyeth is his daughter. Wyeth passed away in 1983. 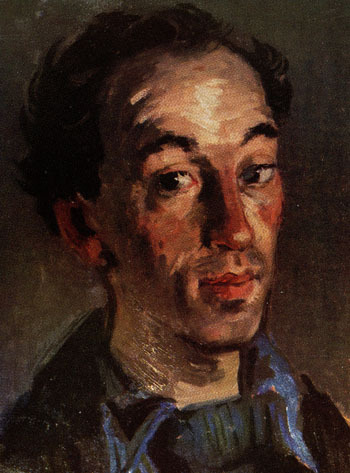 Self portrait by Paul Wyeth, circa 1953. Illustration from How to paint in Oils, 1953. Elek Books Ltd, London. Some Are Hung, a British Path&eacute; newsreel from 1960, shows Wyeth varnishing his conversation piece Concert at Chelsea Arts Club, at that year's Royal Academy Summer Exhibition. 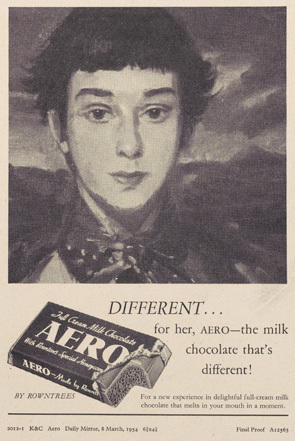 Aero advert, 1954. R/ Guardbooks/S10. Borthwick Institute for Archives. By permission of Nestl&eacute; UK & Ireland. Wyeth completed just one known Aero portrait commission, titled Audrey. The sitter remains unknown. The portrait was published in the Daily Mirror in March 1954 and the original painting is now held in the Rowntree & Co. Ltd archive at the Borthwick Institute for Archives. Nikolaus Pevsner and David Neave (2002), Yorkshire: York and the East Riding, Pevsner Architectural Guides: Buildings of England, Yale University Press. Art Sales Index. Retrieved 14 May 2014.